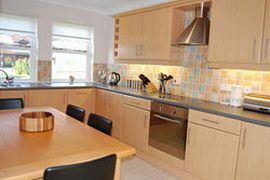 This Northumberland property is situated in the heart of the historic village of Bamburgh on the Northumberland coast. 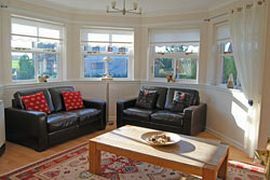 The Turret is a 2 bedroomed ground floor apartment and provides a luxurious standard of accommodation for families and groups of up to 4 people. 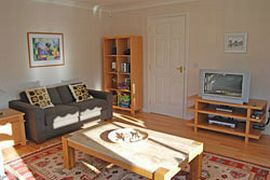 This modern property was built in 2004 and has been tastefully furnished throughout. It offers all the convenience of contemporary living whilst being a stone's throw from the centre of one of the most historic and picturesque towns in the UK. The Turret is situated within the very heart of Bamburgh and is only a short stroll from the pubs and the hotels with public bars (all serving excellent food), the Victoria Hotel with Internet access and a small convenience store. It is only a short 5 minute walk to Bamburgh Castle with it's magnificent dunes and sweeping beach - so popular with walkers, bird watchers and water sports enthusiasts. 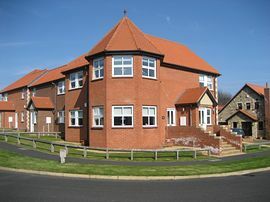 The Turret is also very popular with golfers as it provides an excellent accommodation base for parties keen to play the numerous outstanding courses situated in north Northumberland and just across the Scottish border. Located in the heart of Bamburgh village. Accommodation is very well furnished. Easy access suitable for wheelchairs via gently sloping ramp to back door. Linen provided for king size and two single beds. Bath mat provided, but not towels. By agreement with owner. Small extra charge for dogs. Dedicated parking space at side of building. Local Services: Local general store 3 min walk. Pubs and hotel with free wireless internet 4 min walk. Prices range from £260.00 to £650.00 per week, depending on season. The Turret is available for rent all year round. Change over day is Saturday. Guests are requested to arrive at The Turret no earlier than 4.00pm on the Saturday and vacate no later than 10.00pm the following Saturday.